I had two days off this past week and I think I made the most of them. It’s Sunday night and I am adequately sleep deprived and full of good food. The best part is that my sides are sore from laughing so much with great friends. Brent and Tina came to visit this week and it was so good to see them. 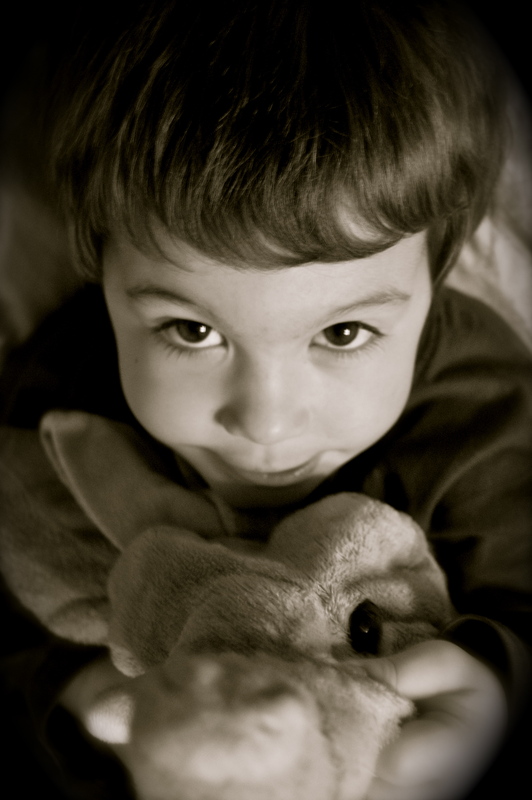 They brought along this little guy – their three-year-old son, Rip. He enjoys posing for pictures, which makes me very happy. He also has a love for yogurt and granola — and Spiderman, I can’t forget Spiderman. Brent and I knew each other in college and then we were roommates for several years. We will always be connected by our never-ending love of the artist forever known as Prince. Brent, along with our friends Chris and Elesha, is also partially responsible for Nathan and I being together. Brent is also responsible for at least half the keys I’ve ever had being lost and for teaching my dog Sadie how to play, “get the shoe.” It’s not a game I recommend for all dogs. Luckily, Sadie did not like chewing on shoes. Brent also went to the same high school as Nathan, though they were never really friends until fate brought them together in several bands throughout their college years. I’m not going to go on and on here, but bless Tina’s heart for even trying to figure out all the connections with this group! There are many funny memories between all of us. Brent and I put our single years to good use by writing about a hundred songs and we rarely get to work on them these days. It’s a hobby that I love doing, but it gets harder and harder to find the time or the creative energy. I am forever grateful to have a writing partner like Brent who will listen to me play the G chord on the guitar and sing my out-of-tune country songs to him – sometimes in the middle of the night over the phone. That’s a true friend, people. 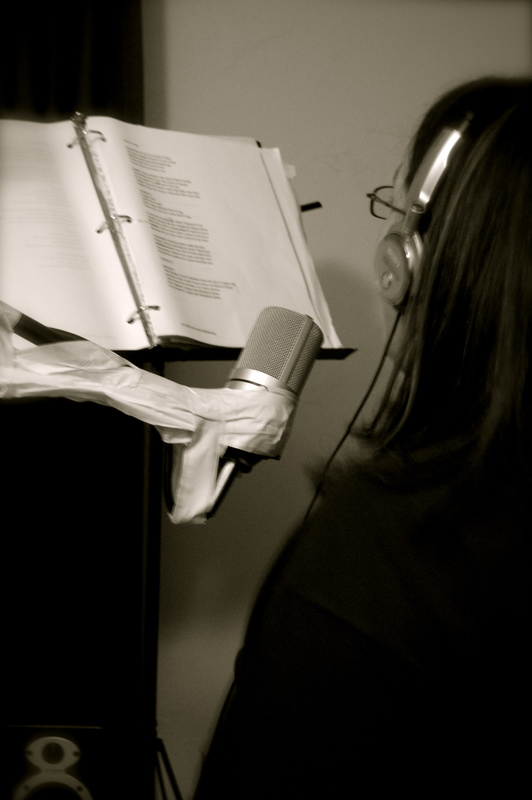 Our goal this weekend was to record one of our songs. On Thursday night, we invited a good friend of ours, Shayla, up to sing and twisted Nathan’s arm to play some guitar and Guit-Jo. 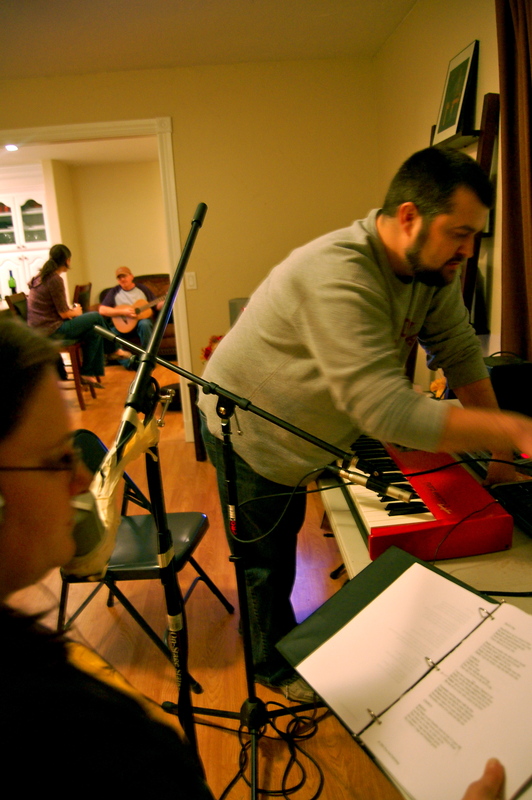 Despite the recording being done in our living room with an open-air mic, and the fact that the guys couldn’t get us ladies to shut up for anything … at the end of the night, we had a full recording. Shayla did a great job singing! 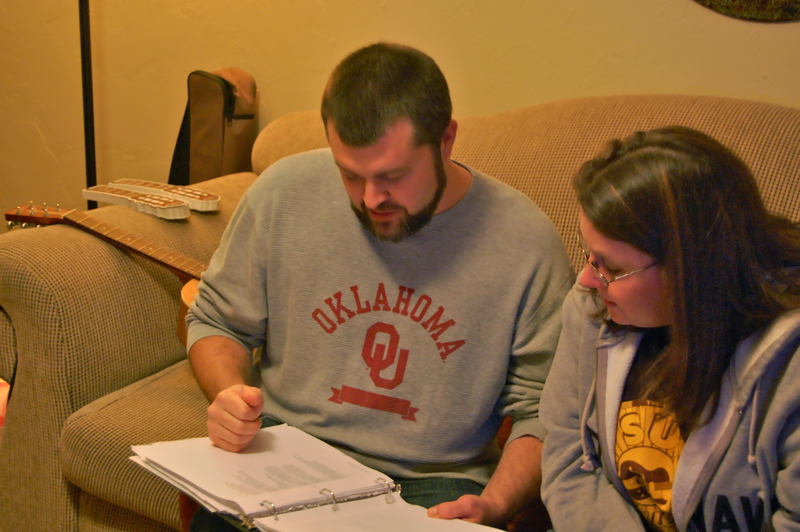 Brent and Shayla going over the arrangement. 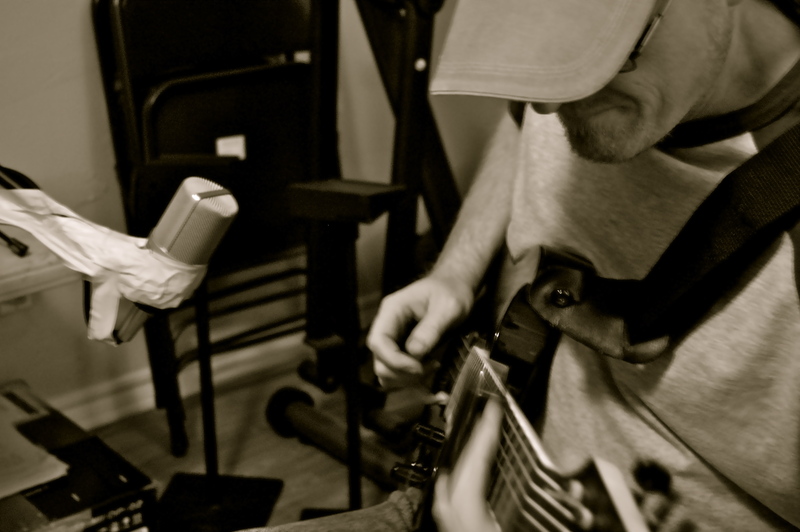 Nathan playing some slide guitar. 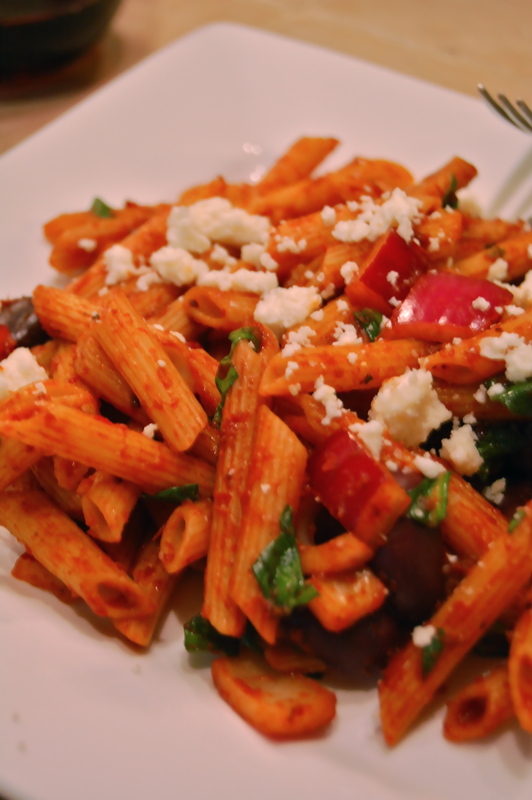 Nathan also made some spectacular pasta – I hope to post the recipe soon. Brent also brought several wines from Homemade Wines of Odessa. It’s a custom winery that is owned by Tina’s dad in Odessa, Texas. I’m getting together a post about the wines he brought and it should be up soon. 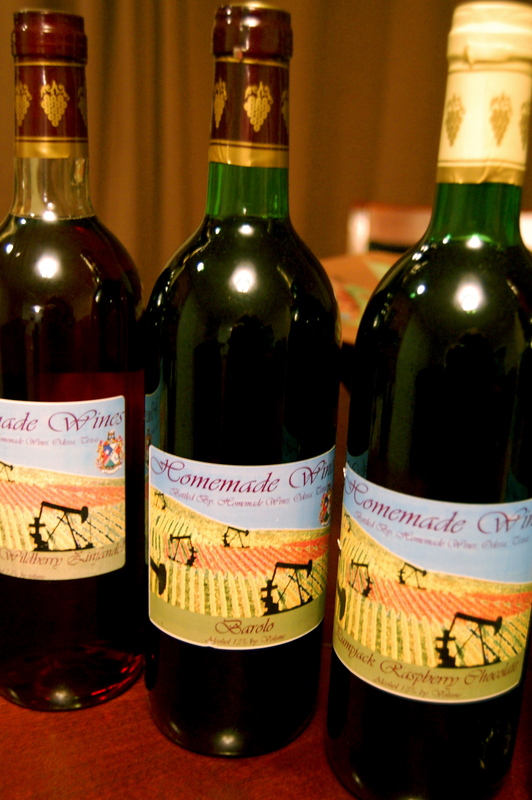 A few of the wines from Homemade Wines of Odessa. We had good food, good wine and great company. It was just the beginning of the weekend, but it was a pretty good start. If I figure out how to post the song, I will point you to it. I think Brent may upload it in a few days and then we can all listen. So Slim, I can tell Dhita that you’ve finally moved out of the 10th century and don’t have dirt floors anymore. That’s good news. Looks like you guys had fun at the weekend. I’ve been reading a lot about wine. It’s definitely good for you, but for people like us who are probably at risk of diabetes, we’re only supposed to consume 5 oz a day, which isn’t very much. I’ve been reading about “Blue Zones” as well. You probably know what they are: communities or places where people average very long lifespans–usually in the 90s. Lots of things in common: herbal teas, fresh fruits a vegetables, exercise. Too much work for me now, but I hope some day I can put those lessons into practice. I hope both of you have a great week. God bless. It was a great start to a wonderful weekend for me, too! Can’t wait to hear the finished product! Thanks for everything Misti & Nathan. We had too good of a time. Just need to figure out how to make it happen more often. The tune hasn’t been completely finished yet but is sounding great. My dad loved it and that says something. Rip still talks about Nathan everyday and plans to go harvest again next week but hates the fact that Oklahoma is a long, long, long, long, long, long way from home. The food was perfect and the bathroom is amazing Nate. Thanks again. Dirtshoe or die!